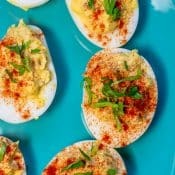 This is a sponsored conversation written by me on behalf of KitchenAid. All opinions and text are mine. 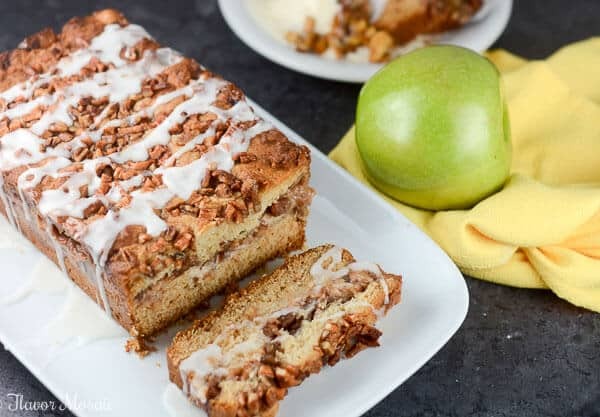 This Apple Pecan Cream Cheese Cake made with fresh apples, cinnamon, chopped pecans, and a cream cheese filling, topped with a vanilla glaze is a delicious fall dessert your guests will love. Yay!! 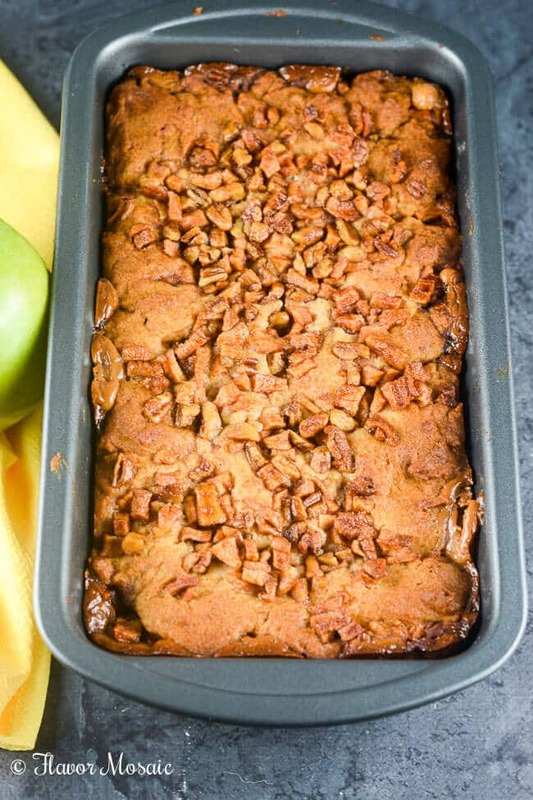 It’s Fall baking season, which means it is fall apple season! 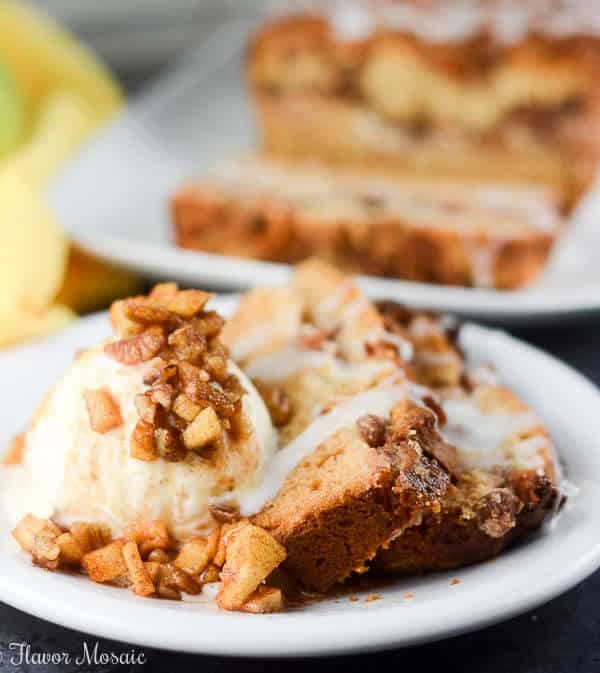 Never mind that it is 100 degrees outside here, I just crank up the a/c and start baking fall desserts! Baking makes me happy. Apples make me happy. So this Apple Pecan Cream Cheese Cake makes me very happy!! 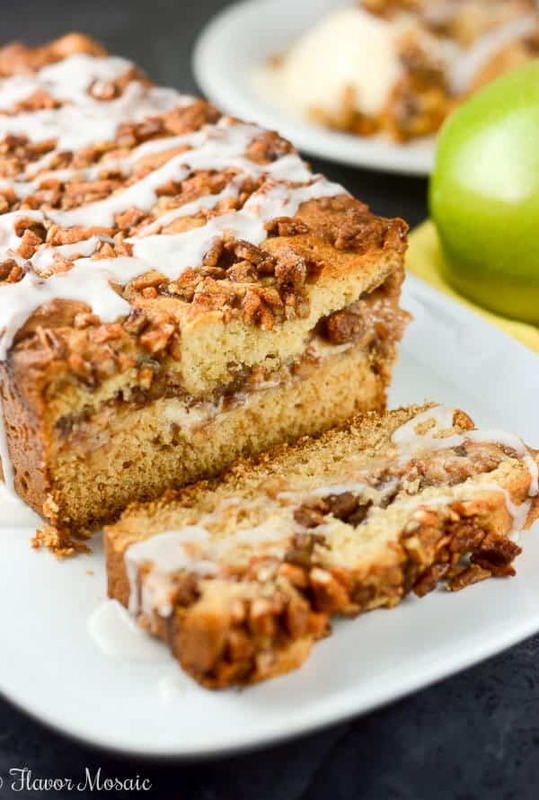 To make this Apple Pecan Cream Cheese Cake, dice fresh apples. I like to dice the apples so I don’t have large chunks of apples in the cake. 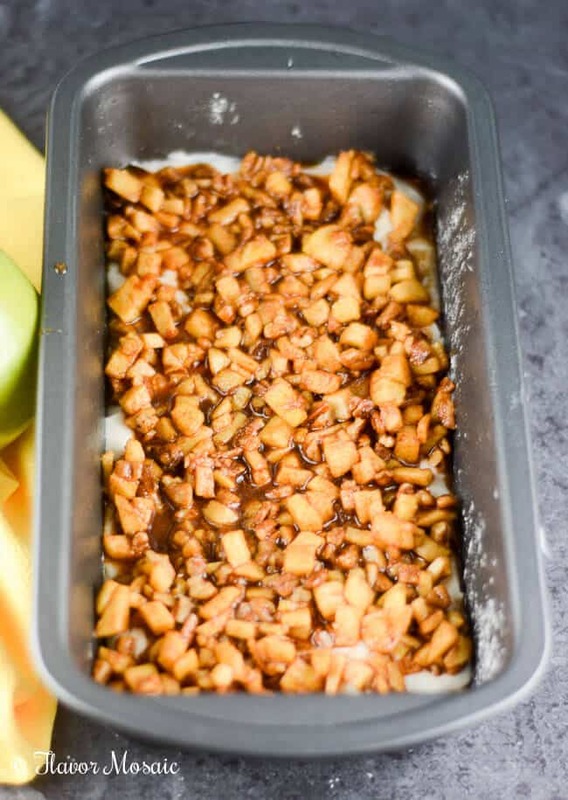 Then combine the diced apples with cinnamon and chopped pecans. For the next step, get out your mixer, preferably your KitchenAid Stand Mixer. What!! You don’t have one? Then keep reading to find out how you can win one of your very own! 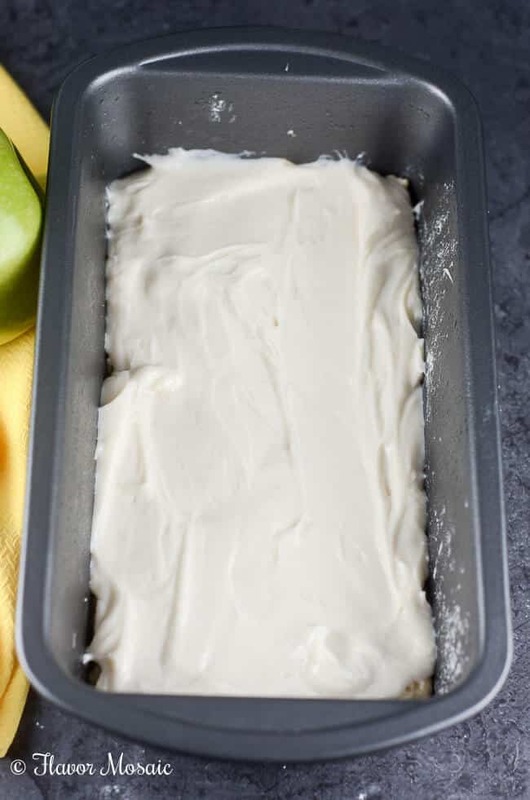 Using your KitchenAid Stand Mixer, mix together the ingredients for the cake mix, and spoon half of the batter into the bottom of a loaf pan. Don’t worry. 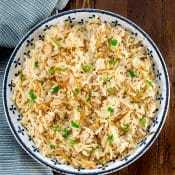 A printable version of the recipe with detailed instructions is below. For the next step mix together the cream cheese, sugar, and vanilla for the cream cheese filling. Spoon that on top of the cake batter in the pan. Then spoon half of the apple pecan mixture on top of the cream cheese, followed by the remaining cake batter. 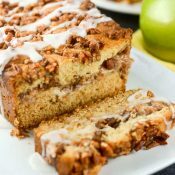 Then bake the Apple Pecan Cream Cheese Cake in a preheated oven for about 1 hour and 10 minutes, or until the cake is browned on top and a toothpick in the middle of the cake comes out clean. While the cake cools, mix together the vanilla glaze. When cooled pour the glaze over the top of the cake. 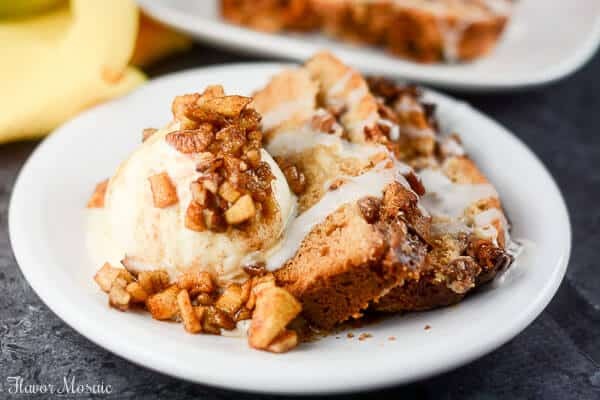 This Apple Pecan Cream Cheese Cake tastes amazing on its own, but to take it over the top, serve it with a scoop of vanilla ice cream and spoon some of the apple pecan mixture over the top. 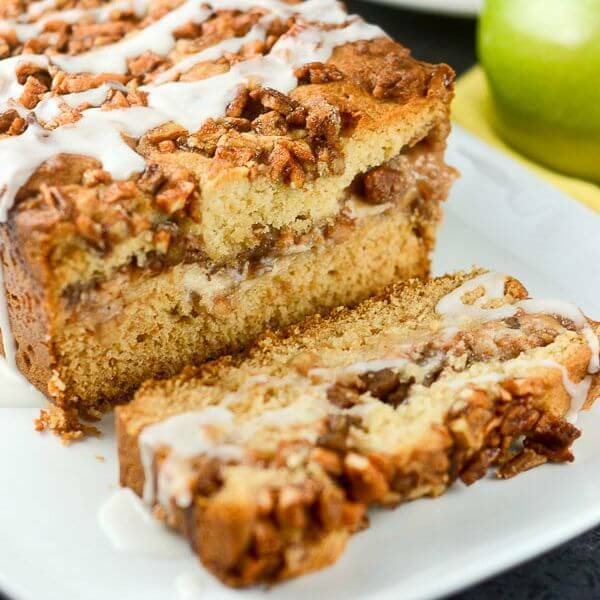 Doesn’t this Apple Pecan Cream Cheese Cake look amazing?! And it smells wonderful while it is cooking. 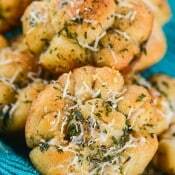 One bite and you will understand why I love fall baking and why this recipe makes me so happy! Remember, how I said you could win a KitchenAid Mixer? Here’s the scoop. 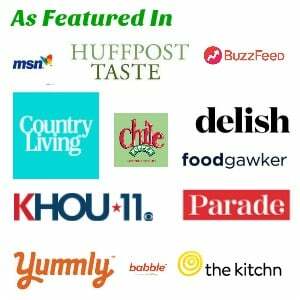 Between August 17th and September 14th, 2015, Food Network and Food.com are inviting you to enter the “apple” recipe cooking challenge where you will submit a photo and description of your best apple recipe. Food Network Kitchens will then select the top 4 recipe submissions, and the 4 finalists will win a trip for 2 to NYC to compete in a live cook-off to cook their dish to be judged by FN chef Geoffrey Zakarian. How awesome is that!! One lucky winner will receive the grand prize of a suite of KitchenAid Black Stainless Steel Appliances and a private cooking lesson with Geoffrey Zakarian. That is an incredible prize! 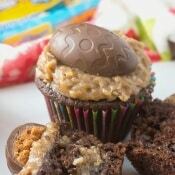 Be sure to tell all your baker friends you know about this. Preheat oven to 350 degrees F (175 degrees C). 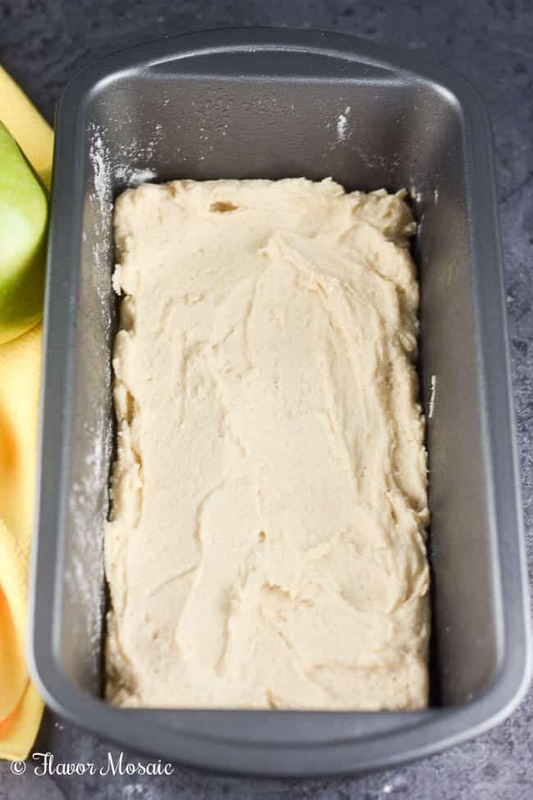 Spray with baking spray or grease and flour a 9x5-inch loaf pan. 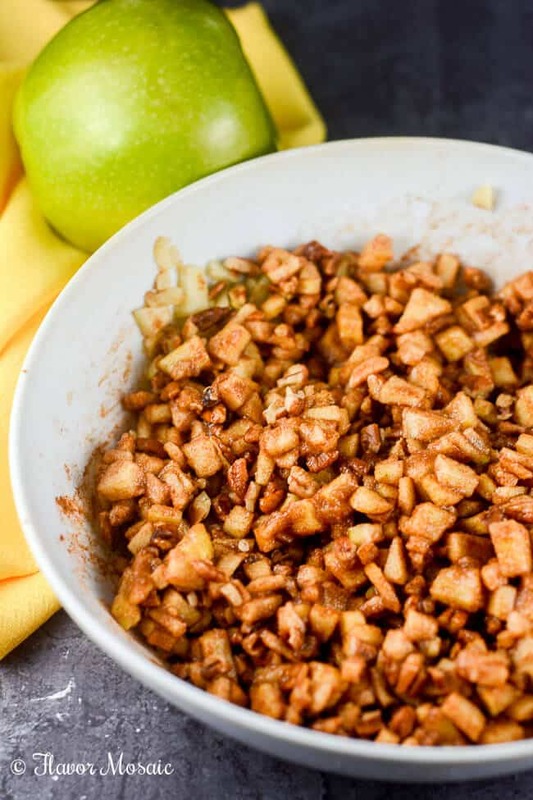 In a medium bowl combine diced apples, pecans,brown sugar, and cinnamon. Set aside. In another bowl mix together softened cream cheese, sugar, and vanilla. 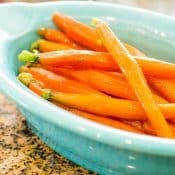 In a large bowl beat together the softened butter and white sugar. 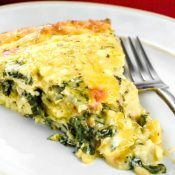 Add in one egg at a time, while continuing to run the mixer. Mix in oil and vanilla. In a separate bowl sift together the dry ingredients: flour, baking powder, and salt. 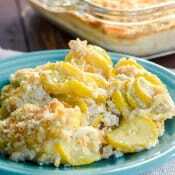 Add the wet ingredients (butter, sugar, egg mixture) into the dry ingredients and stir to combine. 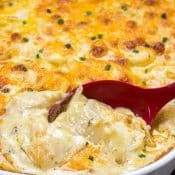 Pour half the batter into the prepared loaf pan; Spoon the cream cheese filling on top of the batter, sing a spatula to even out. Add half the apples and half the brown sugar mixture. Lightly pat apple mixture into batter. Pour the remaining batter over apple layer; top with remaining apples and brown sugar mixture. Lightly pat apples into batter. Bake in the preheated oven until a toothpick inserted in the center of the loaf comes out clean, for about 1 hour to 1 hour 10 minutes. To make the vanilla glaze, mix all ingredients together in a small bowl. Drizzle on top of cake. From the first-ever black stainless steel to the first-ever five-door refrigerator, KitchenAid pushes the limits with our appliances, so our home cooks can do the same with their cooking. 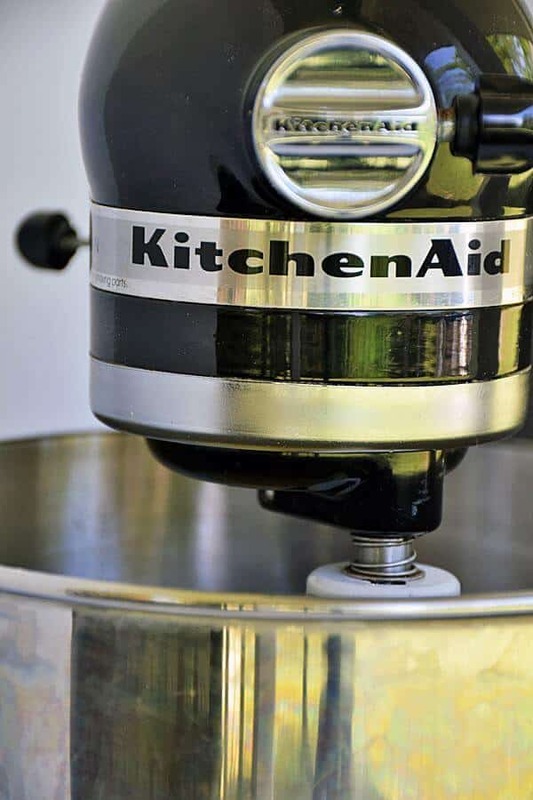 See the revolutionary new line of KitchenAid appliances or visit the Kitchenthusiast™ blog for recipes, tips and more. This is a sponsored conversation written by me on behalf of KitchenAid. The opinions and text are all mine.